The Sample Set will let you experience an ample introduction into the world of Cellusana cosmetics. Feel and see the exceptionality – with 2x 15ml of day cream and night cream that will change your skin appearance visibly. The day cream will give the necessary hydration while the night cream supplies your skin with a comprehensive diversity of nutrients. Thanks to the deeply absorbed cell peptides enhancing the regenerative effect of your skin, Cellusana aims to get you excited for our skin care products and its astonishing results. Free of perfuming agents, Cellusana cosmetics are very well tolerated also by the most sensitive types of skin. By the way, there are no animal experiments carried out for our products. Please try out our Sample Set immediately and make use of the little surprise inside the box afterwards! 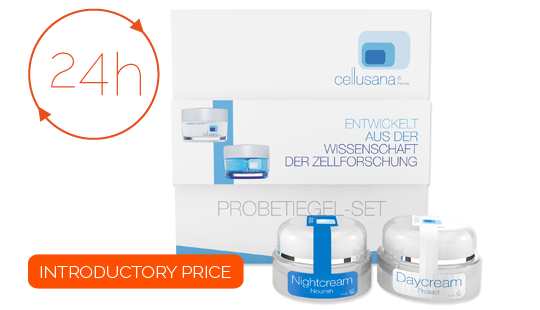 Attractive skin, attractive price: This is our Cellusana Sample Set, available now!